Bullseye Event Group has just announced a savings of nearly 20% on an exclusive hotel package available for Super Bowl XLVIII. We can accommodate Denver Broncos fans and their travel partners for up to four nights at the Marriott Marquis Times Square. Bullseye Event Group, one of the nation’s leading event and group ticket companies, has just announced a savings of nearly 20% on an exclusive hotel package available for Super Bowl XLVIII, which will accommodate Denver Broncos fans and their travel partners for up to four nights at the Marriott Marquis Times Square, the only hotel located in the heart of Super Bowl Boulevard on Broadway. You will only be charged if the Broncos participate in the Super Bowl. Be a part of the football elite during your Super Bowl stay at the Marriott Marquis. Not only is this location the epicenter of activity for the NFL and Super Bowl 2014, it's the home of NFL House, a super luxurious experience for team owners and their families, retired NFL players and the NFL's corporate partners. One of the world's most famous streets gets a super makeover. For four exciting days, New York City's Broadway between 34th and 47th Streets becomes Super Bowl Boulevard - 13 blocks of extravaganza celebrating Super Bowl XLVIII with main attractions and mammoth amounts of football pride for NFL fans, their families and people around the globe from noon to 10:00 p.m. daily. Be where the action is for the coolest game in history - Super Bowl XLVIII. 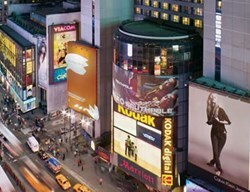 Book the Marriott Marquis Hotel Package at a savings of nearly 20%. Bullseye Event Group also has tickets available to other Super Bowl Attractions like the Leather & Laces Super Bowl Party. For more information about this travel package, or to purchase tickets to any of the Super Bowl XLVIII events, visit: http://BullseyeEventGroup.com/. The Super Bowl Players Ultimate Tailgate is the premiere pre-game Super Bowl party where current NFL players come to celebrate –over 20 active are scheduled to attend from 11am to 4pm on February 2. Celebrities and guests are treated to live entertainment, a five-star gourmet menu prepared by international super chef Marcus Samuelsson, and open premium bar at Gotham Hall, one of NYC’s finest venues. ESPN'S Lindsay Czarniak is serving as Master of Ceremonies, introducing a full line-up of entertainment, including Cirque USA, performances by Vy Higginson's Harlem Gospel for Teens Choir and a special Super Bowl Chalk Talk. In 2013, Bullseye Event Group arranged for former NY Giants Super Bowl champion Michael Strahan to provide insight and share his Super Bowl experience. The Super Bowl Players Ultimate Tailgate is the exclusive place to party on Super Bowl Sunday.